This just came in from Rip Blaisdell. "The RTB 45th reunion is scheduled 31 October - 4 November 2007. Information about the reunion is available at www.usafa.org , Class Reunions, 1962. A link to reserve a hotel room is available now at that website. Options to buy football tickets, class merchandise and reunion events will be available soon on the website. A continuously updated reunion schedule is also available. If you have questions, please contact Rip Blaisdell, (719) 686-1408, tharipper@msn.com." Thanks Ripper and the other members of the Reunion Committee. We’re looking forward to another great reunion. Paul Landers sent this email. "Jo Anne and I were in southern California last week, and spent some time with Roger and Judy Rhoades. They have a great house in Orange, which they have lived in since Roger retired from the AF and worked for Northrop. They are both in good health, except that Roger had a rotator cuff operation on his pitching shoulder a week before we arrived. 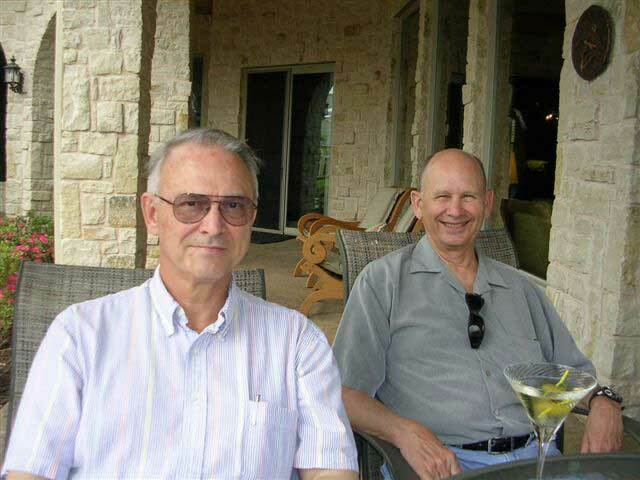 I attach a photo of the two mature Redtags...me on the right, Rog on the left." You two look like the cats that swallowed the mouse. What was going on? Win the Lotto or something? L-R: Roger Rhoades and Paul Landers. Got an email from Logan Babin lamenting his predicament. "I was crushed to learn that the 45th Reunion would be October 31 to November 4 this year. I have previous commitments in San Francisco, CA, and Lumberton, MS on those dates and will miss the first reunion in history. Whoever is going to do the 50th please get the dates out ASAP. A year plus in advance is not too early." I hear you, Logan. My memory is a little fuzzy but I think that the AOG has a procedure that they go through to match reunion dates with home football games and other considerations. If a class wants to have AOG support for their reunion (registration support, attendance and support at other functions, meeting places, staff briefings, etc) they have a choice of dates offered in some priority order. Those dates are subject to change without notice. That may have been the case this year. Or it could have been that the AOG had to wait for some information before they could firm up the available dates. I don’t know for sure. I’m guessing. I know that we have always relied on the AOG for support. I’m sure your feedback will be taken into account. You will probably be the chair of the next reunion committee. I’m joking…I think. Next, I got an email from Don Shepperd. 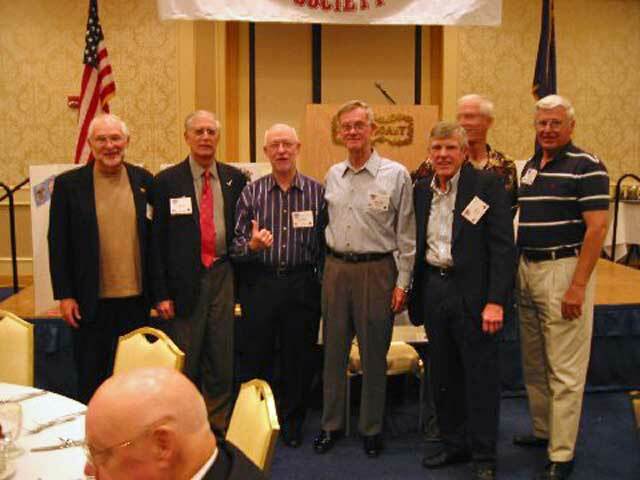 He enclosed a picture of fellow RTB "Hun" drivers at a recent F-100 reunion in Vegas. Were they ever young? They look like they are going to try out for a spot on American Idol…as prop men. I’M SERIOUS. L-R: Rudy Bow, Don Shepperd, Lanny Lancaster, Pete Robinson, Jim Mack, Dave Bockelman and Al Mosher. Got an email from Charlie Hale saying that Dave and Ann Whitman stopped by for a visit. "We were most pleased when Dave let us know via cell phone that he and Ann were on the way to Arizona to visit with family and had re-routed a bit to spend the night in Moreno Valley (March 1st ). So, Pat and I arranged to pick them up and enjoy a delightful dinner at one of our favorite restaurants. It had been since the last gathering in C-Springs since we saw Dave and Ann; how great it was to be together again, have a glass (or more) of wine, and do some catch up. As you can observe from the picture, we are all happy and well, and still enjoying life and far from ‘bewaring the Ides of March’. I’m still at Visterra Credit Union (formerly March Community CU) as the VP Marketing (11 years). I’m thinking more seriously about retirement one of these days especially since our elder son, Charles R., has graduated with honors from the Art Institute of Orange County and acquired his BS in graphic design. Should anyone wish to see his portfolio, go to www.crhaledesign.com. Our other son is supporting his family while pursuing a BS in Network Security degree. He and his wife, Bridgette, are the proud parents of our only grandchild, Noah, who is now four years old. We are looking forward to our USAFA 45th reunion in late October. It is always great to get together with everyone and catch up. Hope all is well in Florida and that you have everything under control in the Sunshine State. Best regards, Charlie." 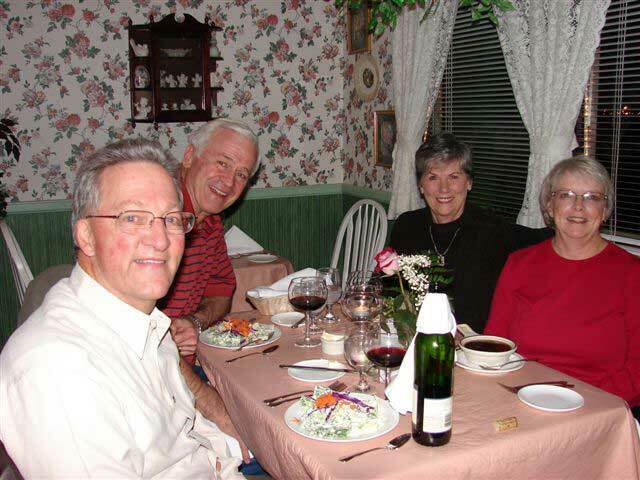 .L-R: Charlie Hale, Dave Whitman, Ann Whitman & Pat Hale. 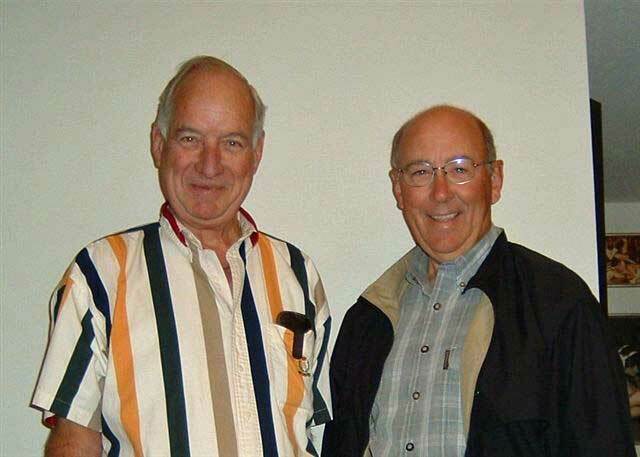 I got a picture of Chuck Turner and Gary Forrest taken after his Mom’s funeral. I couldn’t locate the short note that came with it. I know it meant a lot to have a Redtag pay respects to his Mom. I got a Picture of Art Farrington with his newest granddaughter, EMILY ABIGAIL HIMES, born on March 23rd, weighing in at 8 lbs 11 oz. measuring at 21 ½ inches long. I didn’t have room left to show it. Maybe next issue. That’s it for now. OH, I almost forgot, I’m on another diet. But it’s not really a diet because I’m LOSING weight. I lost 30 lbs in the last 12 months. This is probably a significant life change, like a late sixties male menopausal misdirection or something. It has to be because I always gain weight when I go on a diet. So I’m not on a diet, I’m just coincidentally losing weight. That’s it for now. Next Shuttle launch is in June, we pray. See you all in October.